This little story is one that I unearthed in a book that I bought only a few days ago – a little volume of Toldervy’s Epitaphs from the mid-eighteenth century. Here’s how one little note written in there a century or so ago reveals the forgotten tale behind a very mysterious grave indeed. This mysterious stone and its inscription are stood up against a brick-built table tomb in the graveyard of Christchurch Priory in Dorset. There’s plenty of old legends about this stone; some say it refers to shipwrecked mariners or smugglers who were buried there, while others reckon it’s the grave of an unfortunate soldier killed in the civil war. The latter, even with the change between old style and new style dates, is quite impossible, since the civil war didn’t start until over a year after the tomb reckons Henry Rogers died. This is where my book comes in. The final last word of those three lines – viz – also looks like by, in which case the sentence is unfinished and the unknown author of the note must have had no luck finding who stole the coffins. Henry Rogers was a wealthy gentleman of Christchurch, regularly involved in the administration of the town. He seems to have been descended from a line of wine merchants, and was successful enough to have been mayor in around 1640. His family had already been for some years key players in town politics, and indeed would continue to be for the entire seventeenth century. Henry stops appearing in records on 1st April 1641, about a year after he stepped down as mayor, and, as the above tomb explains, within a few weeks he had died. He was buried at his local church, Christchurch Priory. One key fact we can now suppose about his funeral is that he was wealthy enough for it to be a grand affair, and he was buried in a fine lead coffin. Now we come to the subject of his unusual epitaph. In 1642 the English Civil War began and Dorset was a reasonably Royalist area compared to the rest of the country. There was a small regiment of soldiers garrisoned around the town, but they seem to have been quite unprepared or entrenched against any enemy action. On April 7th 1644 there was a surprise attack by Parliamentarians under William Waller and the town was taken, with apparently almost the entire Royalist garrison captured. Here the Parliamentarians immediately showed their great disrespect for the likely still very catholic-feeling priory building, and stabled their horses in it. Over the next year there the town changed hands between the two sides, including one point in January 1645 where for a few days a Parliamentary force was besieged within the church itself. As the note in my book says, the stone was raised for men whose Coffins had been stolen for shot. Indeed, it would seem that for want of lead, the church roof likely already having been stripped and the Iconoclastic Roundheads having smashed apart the lead-glazed windows, eyes turned on the churchyard. It’s not clear which side is responsible, but more extreme Parliamentarians are certainly known to have had no shame in defacing churches and monuments. Indeed, there is the famous tale of Winchester Cathedral’s windows being smashed when Roundheads broke open medieval tombs in the church and threw the bones at the glass. It was common in medieval Britain for wealthy people to be buried in lead coffins, and that practice had continued into the 17th century. There were ten graves found in the churchyard that were known to belong to once-wealthy incumbents and so these were dug up. The bones and decomposing remains were unceremoniously thrown together – heere we ten are one – before being covered over. The message on the stone reads very much like a warning; how can you live happily, when you can’t even let your ancestors rest peacefully? 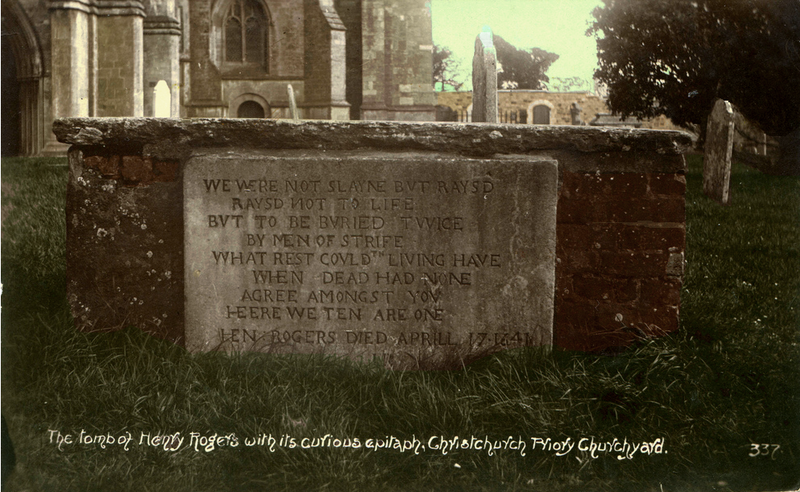 This message could well have been carved when the churchyard was full of fresh graves of soldiers killed there, hence why start the epitaph by saying how the men here were strangely not slayne but raysed. By the end of 1645 the town had regained some moderate peace, and a new mayor was elected; John Rogers. This man must have been a close relation to Henry, as the position of mayor seems to have been held by fathers and sons of the Rogers family many times through their 17th century generations. This man I can only suppose is the JR whose initials appear at the bottom of the stone, fed up with a war that had ruined his town and disrespected his dead relative to the utmost extreme. The stone carving itself is unusually naïve even for the period, and could well be evidence of the local stonemason having fled, so a less experienced local cut the text. There, then, my dear and happy Reader, is all I have to say on this little subject. What an unusual story to come of buying an old book.